The game had a very big importance for second-ranked Al Sadd as it allowed them to take a leadership position. Al Sadd defeated 8th ranked Al Khor in Doha 58-54. Bosnian-Serbian power forward Miroslav Todic (205-85) orchestrated the victory by scoring 16 points and 8 rebounds. Serbian swingman Andreja Milutinovic (199-90) contributed with 19 points and 5 rebounds for the winners. American point guard Ameer Jackson (193-94, college: Winston Salem) replied with a double-double by scoring 20 points, 12 rebounds, 4 assists and 5 steals for Al Khor. As mentioned above they are at the top of the standings, which they share with Al Shamal. Al Khor lost third consecutive game. They keep the eighth place with seven games lost. Another exciting game for Al Wakrah (5-3) which played in Doha against one of their biggest challengers Al Arabi (4-4). Fifth ranked Al Wakrah upset home team edging them after exciting game by two points 72-70. Worth to mention a great performance of American point guard DaQuan Brooks (177-90, college: W.Connecticut) who helped to win the game recording 18 points, 8 rebounds and 8 assists and Joshua Caldwell who added 19 points, 5 rebounds and 4 assists during the contest. The former international swingman Khalid Abdi (198-87) responded with a double-double by scoring 15 points, 14 rebounds and 8 assists. Al Wakrah moved-up to fourth place. Defending champion Al Arabi dropped to the fifth position with four games lost. They share it with Al Gharafa. Another interesting game was a derby match between two local teams from Doha: Al Gharafa (#6) and Al Ahli (#7). Al Gharafa (4-4) won against visiting Al Ahli (2-6) 83-73. The winners were led by Franklin Session who had that evening a double-double by scoring 33 points (!!! ), 14 rebounds and 7 assists. Even 21 points, 6 rebounds and 5 assists by Julius Coles did not help to save the game for Al Ahli. Al Gharafa moved-up to fifth place, which they share with Al Arabi. Al Ahli lost fourth consecutive game. They keep the seventh position with six games lost. Bottom-ranked Al Rayyan is still unable to win any game. But it was rather predictable considering how strong their opponent was. This time they lost on the road their eighth consecutive match to second ranked Al Shamal (7-1) 91-79. The best player for the winners was Mohamed Harath who had a double-double by scoring 24 points, 15 rebounds and 4 assists. Al Shamal have an impressive five-game winning streak. They keep a position of league leader, which they share with Al Sadd. Al Rayyan at the other side still closes the standings with eight games lost. 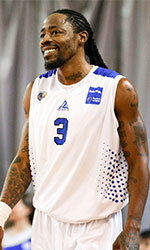 The most impressive performance of 8th round was 26 points and 6 rebounds by Courtney Pigram of Al Arabi. Bottom-ranked Al Rayyan is still unable to win any game. But it was rather predictable considering how strong their opponent was. This time they lost on the road their eighth consecutive match to second ranked Al Shamal (7-1) 91-79. Al Shamal players were unselfish on offense dishing 30 assists. The best player for the winners was Algerian forward Mohamed Harath (198-90) who had a double-double by scoring 24 points, 15 rebounds and 4 assists. Georgian point guard Giorgi Tsintsadze (192-86) chipped in a double-double by scoring 16 points, 6 rebounds and 17 assists. Naturalized Senegalese forward Alioune-Badara Ndoye (199-86) produced 22 points, 9 rebounds and 7 assists and international forward Abdelrahman Abdelhaleem (205-96) added 17 points and 12 rebounds respectively for the guests. Both teams had five players each who scored in double figures. Al Shamal have an impressive five-game winning streak. They keep a position of league leader, which they share with Al Sadd. Al Rayyan at the other side still closes the standings with eight games lost. The game had a very big importance for second-ranked Al Sadd as it allowed them to take a leadership position. Al Sadd defeated 8th ranked Al Khor in Doha 58-54. Bosnian-Serbian power forward Miroslav Todic (205-85) orchestrated the victory by scoring 16 points and 8 rebounds. Serbian swingman Andreja Milutinovic (199-90) contributed with 19 points and 5 rebounds for the winners. American point guard Ameer Jackson (193-94, college: Winston Salem) replied with a double-double by scoring 20 points, 12 rebounds, 4 assists and 5 steals and his fellow American import forward Dominique Lacy (201-89, college: NC-Wilmington) added 13 points and 7 rebounds in the effort for Al Khor. As mentioned above they are at the top of the standings, which they share with Al Shamal. Al Khor lost third consecutive game. They keep the eighth place with seven games lost. Another interesting game was a derby match between two local teams from Doha: Al Gharafa (#6) and Al Ahli (#7). Al Gharafa (4-4) won against visiting Al Ahli (2-6) 83-73. They outrebounded Al Ahli 45-29 including 31 on the defensive glass. The winners were led by American guard Franklin Session (187-89, college: CS Los Angeles) who had that evening a double-double by scoring 33 points (!!! ), 14 rebounds and 7 assists and the other American import forward Nick Stover (198-93, college: S.Alabama) supported him with 18 points and 6 rebounds. Stover is a former Eurobasket Summer League player, which is considered top international summer league in the market. Four Al Gharafa players scored in double figures. Even 21 points, 6 rebounds and 5 assists by American Julius Coles (193-89, college: Canisius) did not help to save the game for Al Ahli. Guamanian-American guard Earnest Ross (196-91, college: Missouri, agency: Haylett Sports) added 23 points for the guests. Al Gharafa moved-up to fifth place, which they share with Al Arabi. Al Ahli lost fourth consecutive game. They keep the seventh position with six games lost. Another exciting game for Al Wakrah (5-3) which played in Doha against one of their biggest challengers Al Arabi (4-4). Fifth ranked Al Wakrah upset home team edging them after exciting game by two points 72-70. Worth to mention a great performance of American point guard DaQuan Brooks (177-90, college: W.Connecticut) who helped to win the game recording 18 points, 8 rebounds and 8 assists and the other American import power forward Joshua Caldwell (203-91, college: William Penn, agency: SDJ Sports) who added 19 points, 5 rebounds and 4 assists during the contest. Caldwell is a former Eurobasket Summer League player, which is considered top international summer league in the market. The former international swingman Khalid Abdi (198-87) responded with a double-double by scoring 15 points, 14 rebounds and 8 assists and American guard Courtney Pigram (185-85, college: E.Tenn.St.) scored 26 points and 6 rebounds. Al Wakrah moved-up to fourth place. Defending champion Al Arabi dropped to the fifth position with four games lost. They share it with Al Gharafa.